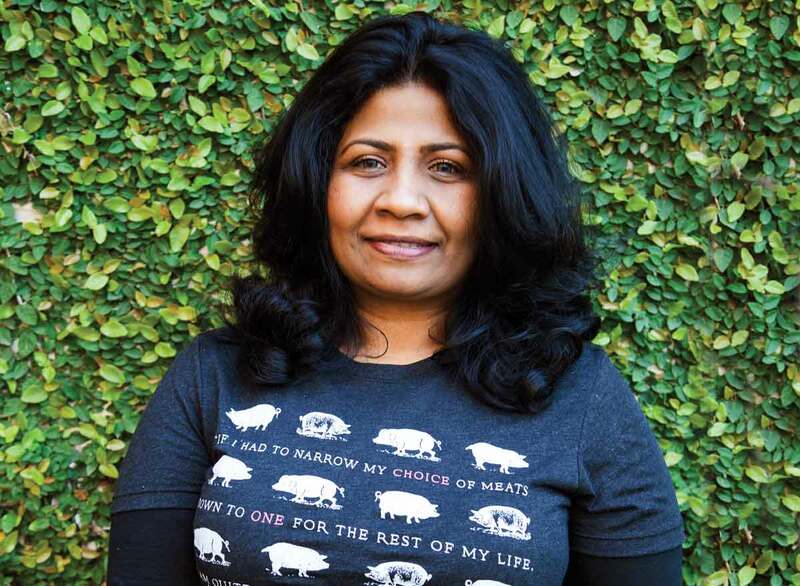 We spoke with chef Asha Gomez, of Spice to Table in Atlanta about advocacy, her experience at the James Beard Foundation's Chefs Boot Camp, and the role chefs can play in effecting change. This is the third in a series of Q & As with the chefs who have participated in the program. We’ll be digging a little deeper into what social issues they are passionate about, what they’ve learned from the James Beard program, and how change can happen when the culinary world puts its mind to it. Read our interviews with chefs Michel Nischan and Jamie Simpson here and here. Modern Farmer: What inspired you to become involved in advocating for ending hunger through legislation and your interest in CARE? Asha Gomez: As a kid growing up in India I was forever getting in trouble with my mom for giving away food, fruits, and chocolates. I was quite sensitive and always tried to help those less fortunate around me. As I grew into adulthood, like many of us, I began to get caught up in the grind of life and rationalized to myself that there wasn’t much one could do to singlehandedly help alleviate suffering around us. An opportunity came my way to volunteer for CARE and travel to Peru to see one of their programs in action and it completely and arrestingly changed my outlook on life and what could be accomplished in making a difference in the lives of a small community. I realized that there is tremendous power in mobilizing resources collectively and that making your voice heard at the policy level was crucial. A bulb turned on and it has become my raison d’etre. MF: Do you feel that as a chef you have a greater responsibility to be an advocate for ending hunger than people in other professions? AG: Well, to the extent that I feed people for a living and people come to me to satisfy their hunger. I felt that it’s a travesty that only those who have the means and access can do so, and when there is so much abundance in our world there are too many who go to bed unable to satisfy such a basic human need. We have an opportunity to change the way people interact with and make choices about the food they buy. MF: Why did you choose to become a chef and what has the journey been like so far? AG: The culinary world chose me and the journey thus far has been amazing and life-transforming. The public has been so incredibly receptive and embracing of a cuisine that is my heritage and that I am passionate about. I’m incredibly grateful for the opportunity I’ve been given to share my life experiences and personality that finds it’s way on to a plate. MF: What was your time at the Chefs Boot Camp like and what did you take away from the experience? AG: I had a phenomenal experience with the James Beard Foundation boot camp. I was already involved with advocacy work, but I came out of the experience even more emboldened and inspired to use my voice in conjunction with many others to truly be an agent of change. The JBF gave us the tangible tools and available resources to try to do some good in our communities and the world at large. Some indelible bonds were formed, which is quite inevitable since I was surrounded by some of my culinary heroes and this amazing group of doers and impact-makers. I will always treasure the experience. MF: How have you found the time to dedicate to your cause of choice? AG: I think when something is important enough we find the will and the way to make time to do the things we are passionate about. For me, it’s being a voice and joining the chorus of voices to eradicate hunger in our lifetime. MF: Have you found that the restaurant business in general is open to the idea of advocacy? AG: Yes, I think that the community of chefs are a wonderfully generous bunch of people. Because of the nature of the work and the intense hours that are involved, what is lacking is finding the right vehicle to express their advocacy on the macro as well as micro level. That’s where working with a NGO like CARE can really make a difference in effecting lasting change. MF: Do you have any advice for other chefs who might be thinking about becoming advocates for a cause? AG: To the extent that more and more today chefs have a voice that people listen to and respect, we have an opportunity to change the way people interact with and make choices about the food they buy. As chefs,we can use our time in the limelight to be the voice for those whose needs aren’t always heard, and we can find ways to help locally in our own communities and reach out to others doing good work. My fellow chefs are truly a passionate community of human beings – when armed with the right tools and resources their voices can be powerful.